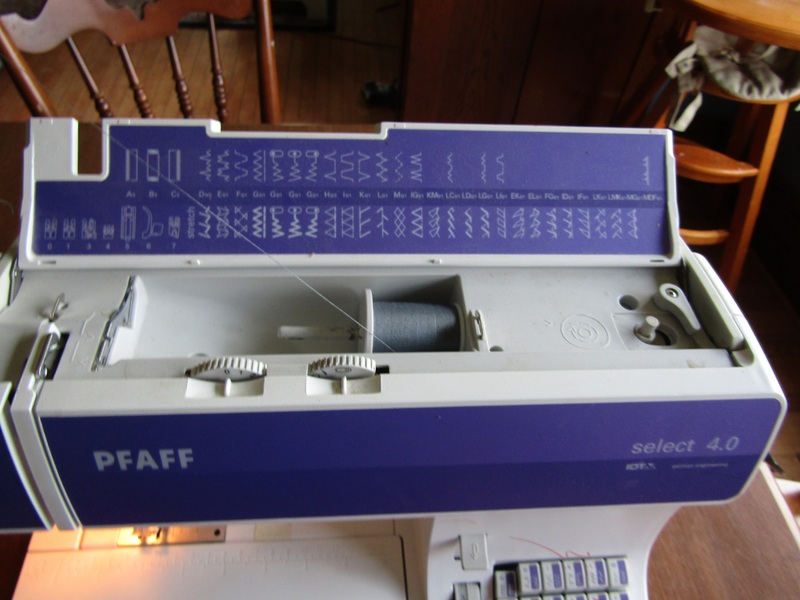 Setting up your sewing machine properly can make or break your first impression of sewing on a sewing machine. Be patient. It may take some trial and error, it may take a few practice runs to get it down pat, but once you have a good understanding of how this works, I think you’ll find you enjoy using your machine. Before you read through this post, if you haven’t gone through our last post about getting to know your machine, you should go back and check it out. And just a heads up, this one is going to have a lot of pictures, and probably a lot of info. There is no way to be concise with this one! Learn how to thread a machine needle, wind a bobbin and replace a needle, and get started sewing! I’m going to try to get a few pictures of different types of machines in here to help explain things, but most of this will be shown on my machine. Take your time and examine the pictures closely if you are having difficulty understanding the directions. I tried to get close up and clear pictures to help illustrate the process. We are an Amazon affiliate. Please read our disclaimer in the side bar or at the bottom of the page if you are on a mobile device. The bobbin post. There is a small little bump towards the bottom side of the post that the bobbin will lock into. Before you even thread your machine, you will want to make sure you have a bobbin wound and ready to go. To wind a bobbin, you must look for the bobbin winder on your machine. This will be located on the top of your machine. It will either be a short plastic or metal post that comes out from the machine, and it will have a little notch which will help to lock your bobbin in place during winding. I am threading my bobbin. The thread can go through one of the small holes in the bobbin to help hold the thread in place as you wind. To start, you will put your spool of thread on your spool post. (Mine requires that I put my spool cap on.) You’ll typically only begin to thread your machine, hooking your thread on the first thread guide. Then I slip the thread from my spool into one of the little holes in my bobbin and hold it out several inches. Next, I place the bobbin on the bobbin winder, locking it in place as I mentioned above. On my machine, I have to push my bobbin winder to the right to engage the winding function on my machine, as well as turning the knob inside of the hand wheel of my machine a quarter of a turn. This will vary slightly from machine to machine…some may only use one of the two bobbin winding features, and they may look a little different from my own. My bobbin is threaded and locked into position on the bobbin post. The bobbin is threaded and now in the correct position for winding. Set the bobbin winding position by adjusting the knob inside of the hand wheel. With my bobbin in place, the winding features engaged, the machine on, I use the foot peddle to wind the bobbin. The bobbin will wind and the machine will whir. My machine has a little arm that is supposed to help stop the winding feature, but it’s broken, so I use my finger instead. Again, each machine will operate this function a little differently. The bobbin should not get filled too full as this will prevent it from working properly in the bobbin casing. Winding a bobbin on the bobbin winder. If there was not enough tension on the thread as the bobbin was winding, your bobbin will not work properly. The thread will not be nice and tight. If this happens, you will need to unwind the bobbin and try again. Once the winding is complete, I clip the thread between the bobbin and the spool. There is also a tail on my bobbin from where I threaded it onto the spool, and I clip that, otherwise, it can cause the bobbin to not function properly. Once you are finished winding a bobbin and are ready to sew, make sure that you turn off your bobbin winding features. In order to remove the bobbin from the bobbin post, I need to slide my post back to the start position. If I do not, I will not be able to remove my bobbin. It is also good to note that it is handy to have extra bobbins of thread wound for colors like white and black, or if you will be working on a larger project such as a dress with layers (for a grown up) or a quilt, there is a high probability of needing extra bobbins. With my bobbin fully wound, I have to move it back into the start position. Wound bobbin back in starting position. Cut the thread between the bobbin and the spool. There is still a small tail on the bobbin from starting the winding process that needs to be clipped. It could probably be left at this length, but if you use a sharp scissors, just get it cut nice and close to the bobbin. I’m going to go off on a little tangent here. It is good to note that it is handy to have extra bobbins of thread wound for colors like white and black, or if you will be working on a larger project such as a dress with layers (for a grown up) or a quilt, there is a high likelihood that you will need extra bobbins of thread in an appropriate color. If I am thinking ahead, I will wind several bobbins at once when I am starting a project or happen to need a bobbin of white or black thread. This is where it comes in handy to have extra bobbins appropriate for your machine. Different machines take different bobbins, so if you are going to purchase extras, make sure you are buying the correct style. Often times you can find them in a fabric store or online, and the packaging will tell you what machines the spools are compatible with. Older machines will typically use metal bobbins, though again, not all metal bobbins are the same. And newer machines will usually use plastic bobbins, and again, they are not always the same. That being said, one particular brand will pretty much be universal in the type of bobbin it uses (though old machines are more likely to use metal vs. plastic). The bobbin gets inserted into the bobbin casing with the thread pointing in the same direction as the slit on the casing. The thread then gets pulled back against this slit and hooked through a small metal flap/hook. That metal flap is the tension for the lower part of your machine. Do not ever try to adjust the tension on the bobbin casing until you have gone through trouble shooting any other issues. A wound bobbin on the bottom. The metal thing is the bobbin casing. My thread is unwinding in the direction of the slit. I then pull my thread up into the slit. This creates some tension on the thread. Hook the thread through the small metal plate/arm beyond the little hook. That plate is the tension for the bobbin. The thread should pull through with a feeling of tension on the string, not sliding through really easily. If you are not sure you have it right, play around with this. The wrong way the tread will pull through easily, the right way will fight you a little bit. With the bobbin in the casing, you will then insert your bobbin casing into the bobbin housing. There is a little arm/lever on the outside of the bobbin casing is a lock that will lock your casing into the housing. There will be a length of thread sticking out from your bobbin casing once it is snapped into place. Leave that alone. The bobbin and bobbin casing go inside of the bobbin housing (underneath the needle and throat plate). Place your bobbin casing into the housing. If it does not want to snap into place, you may have to lift that little arm, push the casing in, and release the arm…. There is a small post in the center of the bobbin housing that will hold the casing in place if it is locked properly. The casing should not spin freely or fall out…if it does, it was not locked in properly. Leave the tail of thread hanging out of the machine for now. Next, you will need to thread your machine. Please note, you will not need to wind a bobbin or rethread your machine every time you sew. I leave my machine threaded and only bother to take the spool or bobbin out if they have run out or if I have to change the color of my thread, or if there is a broken needle or some other issue (we’ll cover that next week in troubleshooting and machine maintenance). To thread your machine, you will need to make sure that your spool is on the spool post, and on machines like mine, you will need the spool cap on to make sure your spool is held in place. On some machines, or depending on the type of spool you are using, it may matter which way you put your spool onto the post. I find with the older style of thread spool from Coats and Clark’s that there is a right way and a wrong way to put them on. This is because the way they used to be designed, there is a small hook on one end of the spool that holds the thread in place, and this hook can catch your thread making it impede your sewing. Along that same line of talk, the new spools of Coats and Clark’s thread are hooked a little differently, and I have fewer issues with the direction of my spool. If you cannot find the end of your thread, look for the little disks on the ends, and you should see a piece of thread tucked in between those disks. You just need to pull that thread to unwind the end of the spool. Okay, threading. Put your spool in place, locking if necessary. The next part of threading your machine is to take it through your thread guides. Yet again, this is one place machines can vary, and they can vary wildly. Some machines will use a little wire that looks like a spring in places, others will have a ring, and others still will use little slits. Mine first hooks through a tension arm, then through the first guide through two tension disks, down under the thread guide, up through the thread arm, and back down to the needle. Some machines have a small little hook right above the needle that you would hook your thread through. Mine does, but I don’t use it as I feel it doesn’t work well on my machine. Finally, you will thread your machine’s needle. I am hooking my thread through my first thread guide (this one is a small silver arm that puts the first bit of tension on the thread. I then hook through my second thread guide. Then I go down through the tension plates. Hook down around the bottom of the thread guide…. And back down to the needle area. 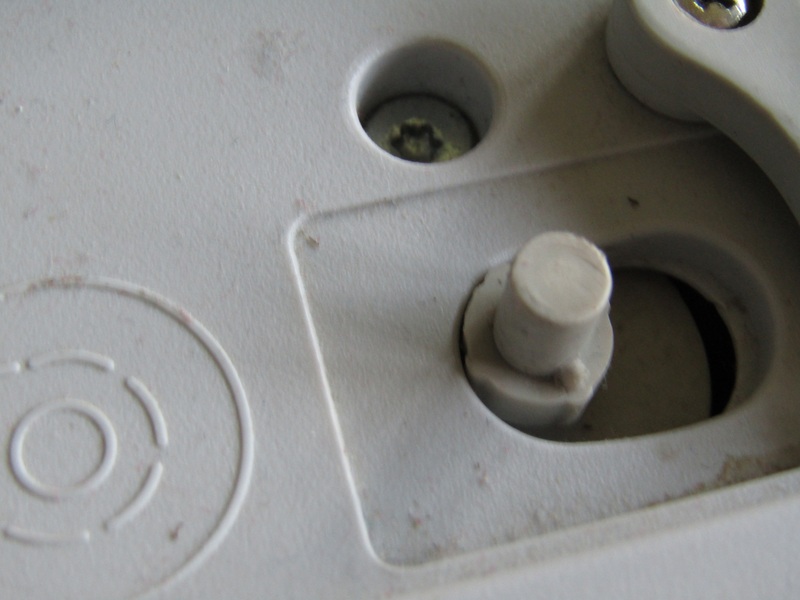 There will be a little screw of sorts on your machine for the purpose of replacing needles. Some need a screw driver, others do not. Mine just twists one way to tighten, and the other way to release. You will take your old needle out (if needed) by releasing the needle. The new needle will have a rounded side to the shaft and a flat side. There will be a right way and a wrong way to put that shaft into the machine, typically the shaft will face the back of the machine, but it will really depend on the machine and needles you are using. Put the old needle in (flat side facing the back of the machine). Make sure you fully insert the shaft of the needle. You will be able to feel when it is in all of the way. Hold the needle in place with one hand while tightening the screw with the other hand. Nearly all machines use the same kinds of needles, but there are some that are different. The needles I always purchase are any of the Schmetz needles. I typically buy the universal needles, but sometimes you will need specialty needles depending on the project you are working on. With your needle installed in the machine (make sure it is in securely! ), you can thread your needle. You ALWAYS thread from front to back. 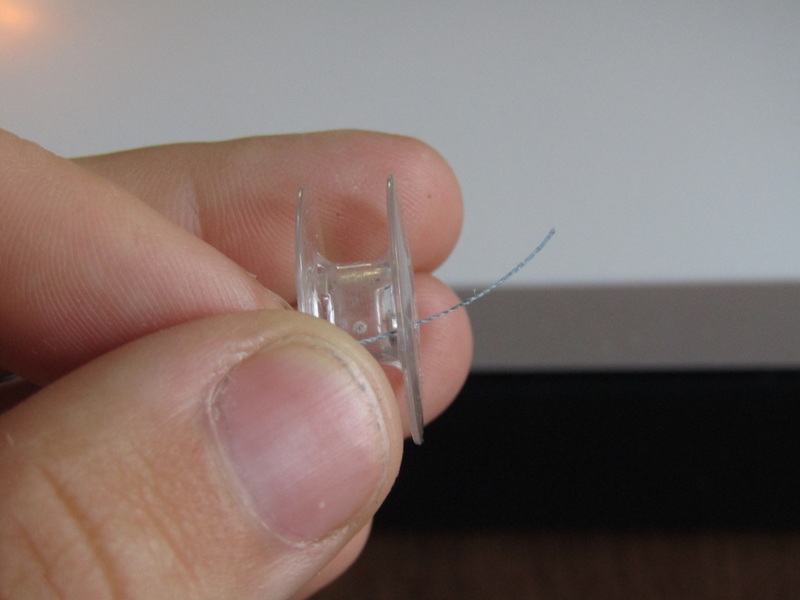 If you have a needle threader on your machine, you can use that, but they are delicate and fussy and can break easily. I have no idea why mine is broken, but it is. The needle threaders you can get in little sewing kits can be used as well, but I always just do it by hand. Make sure the end of your thread is nice and clean before trying to thread the needle. You can lick the tread to clean it up and make it temporarily stiff. I always start threading my needle with the presser foot in the down position, needle in the upward position. This gives your fingers the most room to work for threading your needle. Thread the needle from the front side of the machine going towards the back. Do this wrong and you will not be able to sew without a big headache. Once I am done threading, I lift the presser foot. There is a small slot in the presser foot that your thread should fit through and you can pull the thread through the foot and towards the side or back of the machine. Pull your needle threader down and hook the thread underneath the little arm from the inside to the outside. Finish pulling down the arm so that it is touching the needle. Bring the thread over and across in front of the needle…. Hook the thread on the second arm just to the right of the needle and release the needle threader. If you did it right (or your threader is not broken), your thread should be pulled through the needle. Once you have your needle threaded and your bobbin in place, you will have to catch your bobbin thread and bringing it up through the throat plate. This is not nearly as tricky as it may sound… Start by making sure you have a decent tail of thread coming out of your needle and also a good length tail coming out of your bobbin casing/housing. (If you are unsure, aim for about 10″. It will give you plenty to work with and you can trim your threads later.) With your presser foot in the raised position, hold the tail of thread coming from your needle with your left hand, and turn your hand wheel with your right hand. The needle needs to go fully down and start to come back up. It should catch the thread from your bobbin casing. If you look closely in the pictures below, you can see the thread from the upper portion looping down to catch the bobbin thread. Once your needle begins to come back up, you should notice a small loop of thread come up through the throat plate from the bobbin housing. You need to snag that little loop using your fingers or scissors or some other smaller object that you can fit underneath the presser foot of your machine. That will pull the tail of thread from your bobbin up through your machine. Now both threads will emerge underneath the presser foot. Close the door to the bobbin housing. If you had to remove the free arm from your machine to do this, now is when you put it back in (unless you need that arm open). With your presser foot in the raised position and the door to your bobbin housing open, hold the thread from the needle in one hand while turning the hand wheel of your machine with your other hand. Keep gentle tension on the thread from the needle as you turn the hand wheel…too much and it won’t catch the thread from the bottom, not enough and the needle will become unthreaded. Continue to turn the hand wheel until the tension on your needle thread begins to slacken. Give a gentle tug. Stop turning the hand wheel and look underneath the presser foot. There should be a small loop coming up from underneath the throat plate. And pull the thread from the bobbin all of the way through. Grab the thread from both the needle tail and the bobbin tail and give them a gentle pull. You can clip the thread if needed. It will look something like this after the bobbin housing is closed. Put the free arm back in place if you are using it. From there, I will sometimes clip the tails of the thread if they were too long (for my comfort), or pull them out further to lengthen them a bit for ease of sewing. Regardless of whether I need to clip the thread or lengthen, I always pull both threads through the machine a bit as this give the thread the proper tension for starting. Some machines have a built in thread cutter. You hook your thread through and pull, and it will cut your thread. I don’t always use this, but sometimes I do. My thread doesn’t usually cut cleanly, so depending on why I am cutting the thread, I may opt for cutting it with scissors. Now comes the fun part: sewing! Your machine should now be threaded and ready to go. Double check that your tension settings are at a standard setting (whatever the factory preset would have been for tension and stitch length), and if your machine does more than a straight stitch, that your set to straight stitching ( it will typically show a straight line or a zig-zag or whatever stitches your machine offers). I’m just going to show you really quickly how to do a basic seam. Start with two pieces of fabric with a straight edge. Pin them together. You don’t need to go crazy with pins, but you may want to use more than the two that I used on this 5″ square. Make sure your presser foot is in the raised position. Put your fabric squares underneath the presser foot with the edge of your fabric lined up with the edge of your presser foot. This will create roughly a 1/4″ seam on most machines. (To determine the depth of a seam, measure from the needle to the edge of your fabric…most throat plates will have a measure, but not all will, and most machines have a foot that will give you roughly a quarter of an inch from the needle’s center position to the edge of the presser foot.) With the fabric lined up, put your presser foot down. Hold the tails of thread gently in your left hand while holding down your fabric as you use your foot on the foot peddle to make the machine take its first few stitches. You don’t have to continue to hold that tail after the initial stitches…that just keeps the thread from getting tangled or pulling back up through the machine and out of your needle. I usually go about 3 stitches forward, then holding in your reverse button/lever, go back about 3 stitches. Take your hand off of the reverse button and sew going forward. You should be taking your pins out as you go before your presser foot runs them over. If you do run them over, there is a chance your pins will bend or your needle could hit your pin and break or damage the needle. If you do run them over, it’s probably not the end of the world. I’ve missed many a pin in my sewing years. But you should be cautious. My mom knew a girl in high school that got hit in the eye by a broken needle when she ran over a pin during her sewing class. When you are nearing the end of your seam, you will want to sew right up to the edge of your fabric, do the reverse stitch again (I go back about 3, and then sew until I’m off of the fabric). And pin together. You can use more pins than I did if you want. Line up the pinned edges of fabric with the inner edge (the right side) of your presser foot, and lower the presser foot. Using your foot peddle, sew forward a few stitches on your fabric. Your hands will guide your fabric, but the feed dogs should pull the fabric through. Don’t sew over your pins. Remove them right beofore your presser foot gets to them. If you begin to run one over, turn your hand wheel until the needle is down, lift the presser foot, remove the pin. Put the presser foot back down and continue sewing. When you are a few stitches into your seam, push in your reverse button and go back a few stitches. Then continue sewing the seam. Note the cute baby in the high chair. And continue sewing your seam. Make sure you do a back stitch when you get to the end of the seam. You can see a line of grey stitches, and right at the corner of the fabric on the seam, there is a section where the line is darker… that is where the back stitching happened. Clip the thread and remember to leave yourself a tail of threads by the machine for your next seam. When you are done with the seam, turn your hand wheel so that the needle is in the raised position. Raise the presser foot and gently pull the fabric out from underneath the machine. If your thread is holding the fabric back, your needle is not in quite the right position. Turn the hand wheel until it releases and the thread should pull through easily. Trim the thread from your fabric leaving a long enough tail for you to grab and be ready for the next seam. If you are feeling adventurous, you can start playing around with some of your machine’s settings. 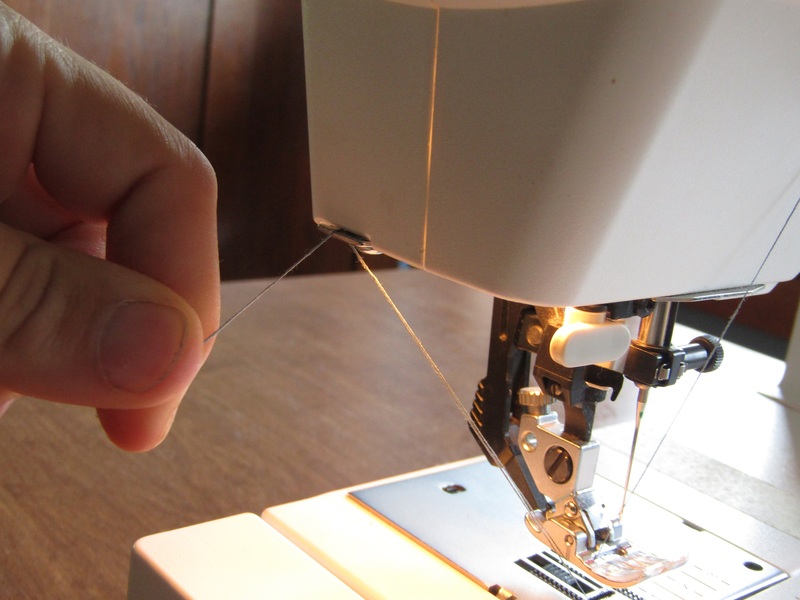 Just make sure you know what your basic sewing stitch setting are before do that. Write it down if you have to! On my machine, I have the stitch width adjuster on the top of my machine. My straight stitch and zig-zag are programmed into the same button. All I need to do is adjust the stitch width and it will make the stitch into a zig-zag. For me, a 5 is the widest zig-zag I can do. On other machines I’ve worked on, they might have different settings or buttons for different width zig-zag. The other settings you can play with are needle position and stitch length. Just be careful if you are going to play with zig-zag. Most presser feet require that you use the zig-zag stitch with a particular foot or with the needle being in the center position. Stitch length determines how short or long your stitches will be. Adjusting the stitch width on my machine to go from a straight to a zig-zag stitch. Not all machines have this particular feature, so don’t worry if you don’t have it! You can kind of see that I did a line of zig-zag stitching, but the tension was not quite right, so my zig-zagging puckered a bit. Keep playing and trying! Have fun! Zig-zag stitches and some other decorative stitches will require that you play around with your machine’s tension settings. ONLY adjust the machine’s upper tension setting and not the one on the bobbin casing. Have fun, play around, practice! A nice straight stitch is very crucial to neat work and even seams. Please, let us know if you have any questions! If you think I overlooked something, I want to hear about it. This is supposed to be helpful, and if it’s not, I need to fix that 🙂 Now comes a slew of questions…How are you doing with our lessons so far? Are they too easy for you? Too complicated? Just right? What are you looking most forward to learning? What is the most interesting thing you have learned so far? 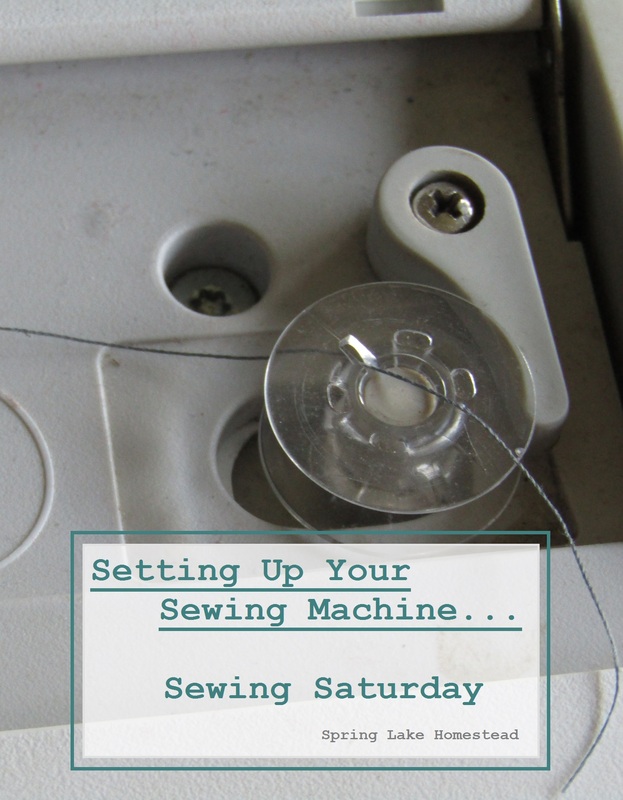 Some of you may know enough about sewing already that you might not need to read all of our posts, but here is a list of all of our Sewing Saturday Posts thus far. I’ll break them down into categories for you so that it is easier to find what you are looking for. I will try to add this list to all of the other posts at some time so it is easier to navigate your way through all of them. Thank you! Threaded my bobbin on first try instead of ren minutes if trial and error and finally getting it right! Glad to hear it! I used to struggle with that one all of the time!